The uplights were exactly what I needed and easy to set up. I would definitely recommend for any event. Thank you!!! Thank you Michael. You were terrific with helping me plan our lakeside wedding. Your lights were amazing. I received so many comments from guests about your lights. Although the globe lights created beautiful ambient light the pin spots gave it that wow factor. Thank you!! Our wedding was last summer but I was so pleased to get an email from them asking for a review because I absolutely LOVED their service. Nicole was so great at helping us get all the lights we needed. We were late in ordering but they arranged for rush delivery and got us everything just in the nick of time. They were beautiful and really made for a perfect wedding. Thank you!! Highly recommend American Party Lights. Great service. 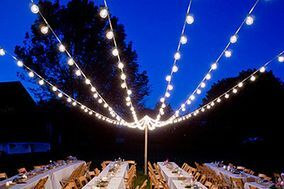 Our wedding was on the beach and we rented the Italian lights which we strung between two main trees. We also rented 4 battery powered uplights to highlight the base of the trees. The effect was amazing! I highly recommend American Party Lights. They worked out great for us. My biggest concern was that the lights were going to be too difficult or time consuming to install.I had myself and 3 bridesmaids (and 1 of their moms so 5 of us total) to install 40 uplights in 1 hour. No sweat! We got the wireless lights and all we had to do was push a button and they were set. Michael had already set the color so I didn’t have to do anything. I HIGHLY RECOMMEND THEM!!! We had our wedding at the SAM Sculpture Garden and rented 15 uplights for the reception. They were amazing! Definitely recommend American Party Lights. Michael was extremely helpful in getting our reservation setup. Our guests commented many times on the lights, they REALLY made the event special. If you're like me and you can't afford a lighting company to come do lighting (or don't want to pay their outrageous prices) then American Party Lights is perfect for you. I highly recommend them! Lights arrived on time, as promised. Couldn't find the return label but they emailed me a replacement. My wedding was last November. Ordering was a bit confusing, I wasn't sure what we needed or how many we should get. But once I figured that out it was a breeze. I never spoke to anyone at this company, it was all done online. That may sound bad, but it was really convenient for me because I ordered it all while I was at work (shh). The instructions that came with the lights were extremely helpful too. I found this company on Google, not WeddingWire, but they reached out to me to leave a review here. I was very pleased with their service. Their lights arrived in fine condition (a few days early actually). We were 2 days late returning them but they were accommodating. Good company. Michael knows his stuff! We appreciated his creativity, his depth of inventory to offer, and most importantly, his integrity and the timely manner he completed his work. He was one vendor I didn't need to worry about, which was especially helpful considering all the things one has to do on her wedding day. The work he does will change the look and feel of your event for the better. I look back on our photos of the day and am so grateful we hired Michael!!! Our community center had limited power so we rented LED globe lights from American Party Lights. I was a bit concerned because I wasn't sure how difficult it would be to setup. Beside 1 broken bulb hanging the lights was easy and the lights looked GREAT! American Party Lights was great. American Party Lights was a great option for us. We got so much more than we would have from a local vendor (which I received multiple quotes from). The lights arrived a few days early and worked out perfectly. I recommend them to anyone. Michael is a really nice guy. I took my lighting project to American Party Lights and this company did a great job. And best of all, he is very inexpensive and always willing to throw in a deal. Excellent customer service as other people have said. Great customer service-the owner walked with me to my place to consult on a lighting project. Above and beyond compared to other store where the workers knew little and they didn't have what I needed. A++ for American Party Lights. Our wedding was last summer (2014). We rented Italian Lights from American Party Lights. The lights were awesome. The website declined my credit card but I called the office and they pushed it through and they were really nice. Overall I recommend them to anyone. This place is awesome! I went to American Party Lights a year ago. They provided high quality lighting on my event for a reasonable price. Everything went stress-free and flawless. The owner is an expert! I'm kind of into lighting! When I visit American Party Lights, I'm like a kid in a candy store. They may not be the friendliest, but they do know their stuff, are very competent and always take care of me. I love their selection! I love this place. They have a good selection of lighting. I am very pleased with the service and selection at American Party Lights. And I always work with Michael who knows his stuff and is always extremely helpful. Great service! The staff at American Party Lights was patient and thorough. They provided high quality lighting on my wedding reception and all my guests gave compliments about it. I would like to recommend them to anyone. Michael help us pick out lights for our party. He was helpful and knowledgeable. American Party Lights is definitely the place to go for lights. Thank you! Just came here when we need lighting for our wedding reception. We were helped by Michael. He was very helpful! Listened to our needs and did not try and oversell, only suggested what we needed. We will definitely be back to American Party Lights!!! Excellent lighting selection and value. It's easy to save money here so you feel good about spending for what you need. Light up people, this place rocks! Thank you American Party Lights.